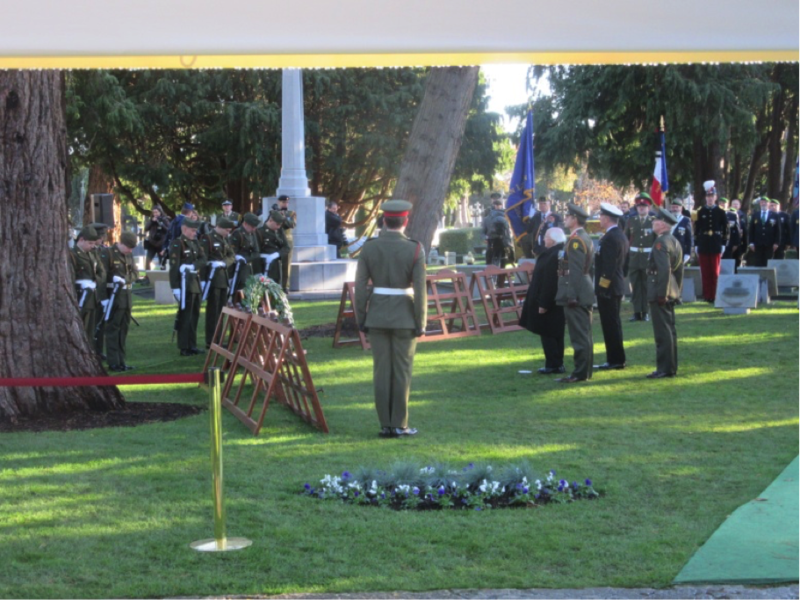 On Sunday 11 November 2017, Glasnevin Trust hosted the formal State commemoration marking the centenary of Armistice Day, which brought to an end the First World War. The day’s events commenced at 1000hrs with the unveiling of five Commemorative Plaques in honour of Irish men who received the Victoria Cross for their acts of bravery in World War One, including the last Irish person to be awarded a VC before the Armistice. This was followed by the State commemoration at 1000hrs. 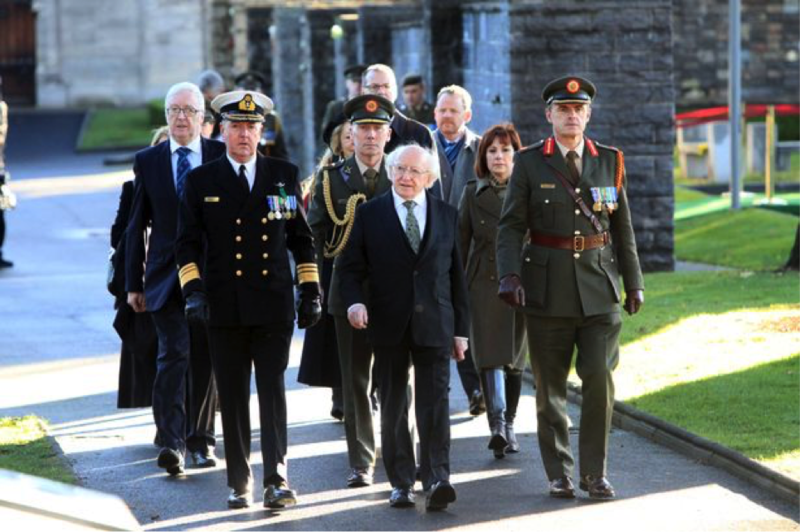 The State commemoration was attended by Uachtarán na hÉireann tofa Michael D Higgins, Minister for Culture, Heritage and the Gaeltacht Josepha Madigan TD, and representatives of 47 countries. Ours is not a celebration of militarism, nor a valorisation of martial spirit, but a simple recognition of our common humanity, as we recall the destruction of the promise and potential of a generation in the first World War. We must remember how easily the powers of Europe, with all their centuries of scholarship, philosophy and learning, cast it all aside and fell into enduring and terrible enmity. Peace will only ever be established and can only ever be sustained when it is based upon the principals of justice, dignity and mutual respect. Let us then, on this day, rededicate ourselves to the cause of peace and the support of those institutions that promotes and preserves the peace. The Commemoration included readings by His Excellency Mr Stéphane Crouzat, French Ambassador to Ireland (Le Dormeur du Val), His Excellency Mr Robin Barnett, British Ambassador to Ireland (In Flander’s Fields), Mr Reece Smyth, US Chargé d’Affaires to Ireland (Belgium), and Her Excellency Mrs Deike Potzel, German Ambassador to Ireland (Excerpt from All Quiet on the Western Front). Rev. David Oxley and Fr. Bernand McGuckian delivered a joint prayer. The wreath laying ceremony, which took place between the France-Ireland memorial and Cross of Sacrifice, was led by President Higgins. Wreaths were laid by the Chief of Staff Vice-Admiral Mark Mellett DSM, Ambassadors from 47 countries, and Veterans’ and Regimental Associations. 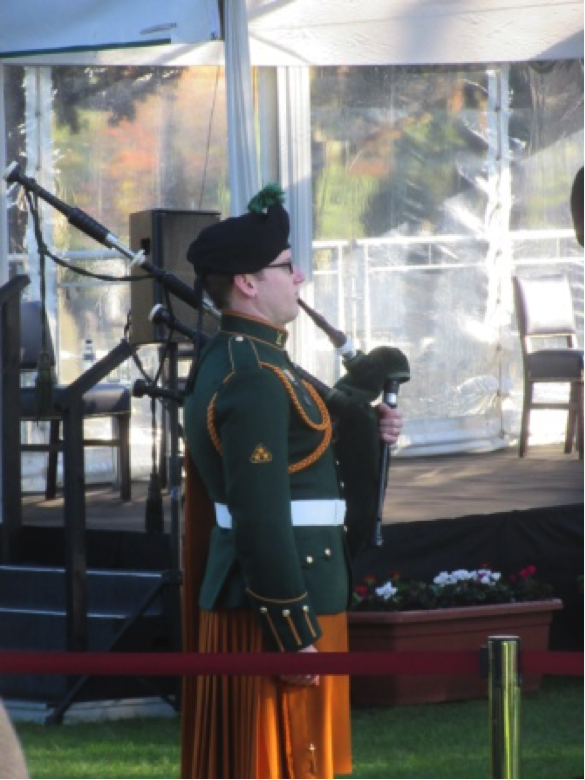 A piper from the Defence Forces School of Music played a Piper’s Lament. An Honour Guard, drawn from the 1 Armoured Cavalry Squadron, under the command od 2/Lieutenant Conor Jamieson rendered military honours for the the Last Post, Reveille and the National Anthem played by the Army Number 1 Band under the baton of Captain Fergal Carroll. Relatives of soldiers who fought in the war joined members of the diplomatic corps, military veterans, and other dignitaries, including Garda Commissioner Drew Harris and former President Mary Robinson, at the ceremony. Today, we reflect upon the unprecedented scale of death and suffering that was endured during the world’s first industrial war. We remember the millions of men and women, soldiers and civilians, from many nations who paid the ultimate price in that terrible conflict. We remember those who survived the conflict but returned home to new political realities right across Europe, including here in Ireland, often times carrying a burden of physical injury and private grief. Over the past four years, we have explored, with respect and compassion, the differing motivations of those from this island, of all traditions, who lost their lives – we will never know how they would have contributed to this land, had they not died before their time. The Decade of Centenaries has shone a light on their stories, many of which were never previously heard. By promoting commemorations that are inclusive and seek to strengthen peace and reconciliation on the island of Ireland, we have promoted also a deeper exploration of differing perspectives on our shared history. We have shown maturity and understanding in reflecting upon our shared history and in giving those who fought in the cause of Irish freedom and in World War I their rightful place in history. Today, as we mark the centenary of the end of World War 1, Armistice Day, we remember all those who served and all who died in that conflict. Here in Glasnevin we especially remember all the men and women from this island who unselfishly offered their service, perhaps as many as one in four giving the ultimate sacrifice, their lives. Over the last four years there have been a myriad of commemorations on this island remembering events that used to define and divide the different traditions on this island. This period of reflection has enabled the vast majority of us to learn about and understand our shared history. The old “Forgive and Forget” attitude is not enough, to forget is simply to bury the problem, true reconciliation is based on understanding; reconciliation is a journey where both the head and the heart must travel in the same direction and ultimately end up in the same place. In 2008, Glasnevin Trust and the Commonwealth War Graves Commission set about the task of marking previously unmarked graves in Glasnevin Cemetery of World War I and World War II graves of soldiers, sailors, air men and women. This task is now complete and 104 headstones or Gallipoli markers have been placed on family graves wherein the remains the fallen lie. In addition, the Trust, along with the Commonwealth War Graves Commission, relocated World War One and World War Two commemorative screen walls from the Prospect Gate area to a more prominent location near Glasnevin’s Mortuary Chapel.